Liquid form (liquid pentavalent vaccine) is available under UIP. 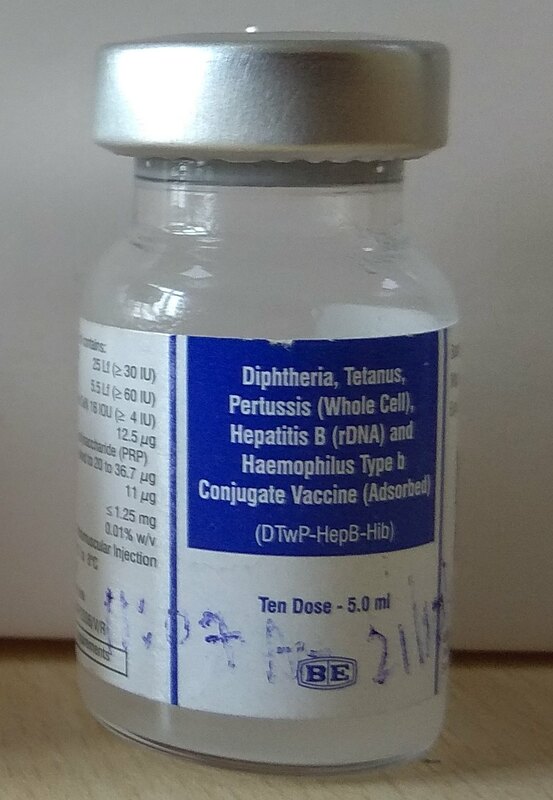 The liquid pentavalent vaccine (LPV) in the UIP (Universal Immunization Program, India) is available as a multi-dose vial with 10 doses per vial. List the 5 diseases against which this vaccine protects. As per the National Immunization Schedule, three doses of pentavalent vaccine are to be administered at 6, 10 and 14 weeks of age. 1. Severe allergic reactions: a child who has had a severe reaction to pentavalent vaccine earlier should not be given another dose. 2. Children with moderate or severe acute illness. However, minor illnesses such as upper respiratory infections (URI) are NOT a contraindication to vaccination. Is a booster dose recommended under UIP? However the boosters for DPT are recommended at 16-24 months and 5-6 yr. of age. Hib containing pentavalent vaccine in India is recommended for infants from 6 weeks to less than 1 year of age. What are the common side-effects of pentavalent vaccine? How can these be managed? A feverish child can be cooled with a tepid sponge or bath, and by wearing cool clothing. Extra fluids need to be given to feverish children. Paracetamol, at a dose of up to 15mg/kg every 6–8 hours with a maximum of four doses in 24 hours is useful for the common minor reactions. It eases pain and reduces fever. List the severe side effects of pentavalent vaccine which may occur rarely. The vaccination also reduces nasopharyngeal carriage of the H. influenzae, leading to substantially greater reduction in disease transmission and incidence. This indirect effect or ‘herd immunity’ has been demonstrated in post introduction studies2. Is the vaccine eligible for ‘Open Vial Policy’ under UIP? Why was the need felt to introduce Hib vaccine into the National immunization schedule under UIP? The need was felt because H. influenzae infection was considered as a public health problem since it causes serious diseases that can result in death and disability. Hib vaccine dramatically reduces the incidence of pneumonia and meningitis due to H. influenzae. In addition, it also reduces nasopharyngeal carriage of Hib bacteria. List some serious diseases caused by Haemophilus influenzae type b (Hib). After introduction of pentavalent vaccine, will DPT and Hep B be required as per UIP? 1. GOI. Immunization Handbook for Medical Officers. New Delhi: Department of Health and Family Welfare; 2016. 2. Park K. Epidemiology of communicable diseases. In: Park's Textbook of Preventive and Social Medicine, 24th ed. Jabalpur, India: M/S BanarasidasBhanot Publishers; 2009.